Martingale strategy is probably one of the most popular betting systems used with outside bets aiming at increasing the player's chances to win and beating casino's advantage. It emerged in the 18th ct. in France where it was applied to all kinds of games of chance. The principle of the Martingale strategy is best illustrated by the simple pitch-and-toss-game. It means that the system works with the even-money bets offering 1 to 1 payout. These are Black/Red, Odd/Even and High/Low bets. The second bet must be twice the size of the first one. If it is won, the system stops again and the player returns to the first bet. The third bet is made if the second was lost. It has to be twice the size of the second bet. If it's won, the player proceeds with the original small bet that pays 1 to 1. The game goes on. Here is an example of a situation where we can see how the Martingale strategy works. The player has made a $3 on Black. If the bet wins, the player may either take the money and leave or go on applying the Martingale. Then he or she will make another $3 bet on Black. If in this case the bet loses, the player makes the second bet on Black. It doubles the size of the first bet and makes $6. If the second bet loses, the player makes the third one which makes $12 (twice the size of the second bet). The bet wins and the player not only covers the losses from the previous spins (they make $9), but also gets $3 profit. Unfortunately, the profits of the players will seldom be high with the Martingale system applied. It is especially crucial in cases if the player continues losing, which is not unusual with the random nature of the roulette casino game. This will make every following bet higher than the previous one, but compared to the losses the profit will ever be the size of the original bet. For example, with a $3 original bet and four lost bets in a row the losses will make $45 ($3 - $6 - $12 - $24 - $48). If the last $48 bet wins, the profit will make only $3 compared to the $45 loss. The other disadvantage of the Martingale strategy is that the player who loses many times in a row may exceed the table betting limit established by the casino. This means that the player will not be able to recover his or her funds lost in the previous spins. Another problem about winning with the Martingale strategy applied is the presence of a zero slot (or even two zero slots on the American wheel). As the zero doesn't count when the payouts are distributed, it gives the casino its advantage (house edge) - 2.63% for European roulette and 5.26% for the American variant. 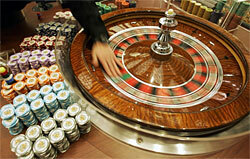 To reduce house edge it is recommended to play single-zero European roulette rather than American.